We know students, classes and our helpers love having a badge or widget on their blog showing they are taking part in the student blogging challenge. Just pick the badge that suits you and then follow the instructions below for adding to your blog. You won’t need to crop or resize the badges as they are 150 pixels in width. 1. Copy the HTML code for the required badge(s). 2. Go to Appearance > Widgets in your Dashboard. 3. Drag and drop a Text Widget into your sidebar. Hi Ms W I did not get a comment from you. Please feel free to leave a comment. Hi Miss W I am Marian and I want to say that I did not get a comment from you so please feel free to leave a comment on my blog or on my posts. Thankyou very much. 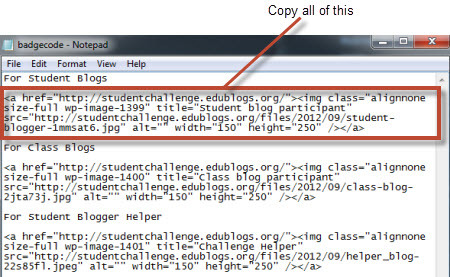 I have just tried to copy the HTML code to get the class badge or our blog but it isn’t working. I have noticed in your post that the code shown in Notepad and the code we are directed to copy are different. Does this matter? 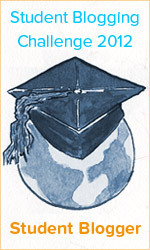 Our blog is http://4gos.global2.vic.edu.au if you’d like to see what happened. Apparently the way I put the code into the post did not work properly. Ronnie, from Edublogs, has now gone in and added it correctly in the post. If you would like to try again today.